A story that began in the first issue of Hellboy concludes with the B.P.R.D. team set to permanently wipe out the subterranean colony of frog monsters that have been a story--driving plague. 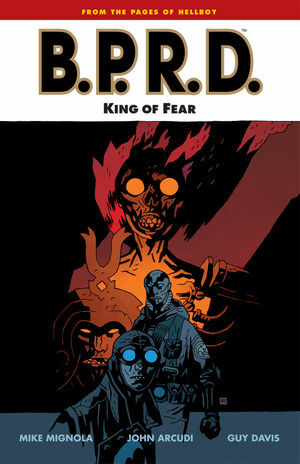 With Memnan Saa dead, agents Liz and Abe take on the powerful King of Fear--who ultimately reveals that it is, in fact, the B.P.R.D. members themselves who will lead the world to apocalypse, not the supernatural monsters, demons, or colossal squidbots. * Collects B.P.R.D. : King of Fear issues #1--#5. * Since being featured prominently in the two Hellboy motion pictures, The B.P.R.D. has established a large readership of its own!